The 2017 Raleigh Spring Triple Crown will once again include the Tobacco Road Half Marathon on March 19, NCRC Classic on May 21, and Race 13.1 Raleigh - Spring on June 3. You must be registered for ALL three events no later than May 1 in order to be eligible for the Triple Crown! Runners who register for all three events by May 1 following the guidelines below and complete all three races will earn the medal to the right! Note: Tobacco Road Full Marathon participants are also eligible for the Spring Triple Crown. You must use the same name and email address to register for all three races. You must be registered for each individual race by May 1, 2017. You must complete the half marathon distance at all three races listed above. Tobacco Road Full Marathon participants are also eligible for the triple crown. 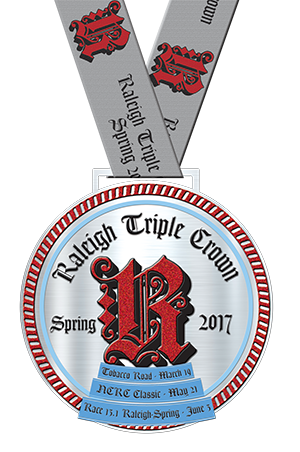 You must be present to pick up the Spring Triple Crown Medal at Race 13.1 Raleigh-Spring on June 3. Medals will not be mailed.